3D-print it, spin it up to 30,000 RPM, and watch it take off like a rocket! This surprising device, like a number of my projects, started out with me working in the lab alone late at night and goofing off with slightly dangerous tools! As some of you may recall, in Make: Volume 31 we did a project called the Mendocino Motor, a funny little electric motor powered by solar panels mounted to its rotor, which floats on magnetic bearings. To test the project, we used powerful incandescent bulbs, but soon discovered that the intense heat was melting the glue that held the motor together. So I was asked to design a 3D-printed fan to be mounted on the end of the rotor shaft. Late one night, the print finished and I tested the new fan. The Mendocino Motor is not highly energetic, so the spinning fan was underwhelming at 100 rpm. Bored and slightly sleep deprived, I figured I’d see what happened if I mounted the fan to a cordless Dremel tool. I grabbed an empty arbor for the Dremel and wrapped electrical tape around it till the fan fit snugly. You can imagine what happened next: I turned on the tool and the fan spun up to 15,000 rpm, generating a torrent of wind behind it. I was pushing the slider switch all the way to 30,000 when suddenly the fan took off like a rocket and crashed into the whiteboard at the end of the room, shattering into a dozen pieces and leaving a fresh dent. I sat there stunned, until the proverbial light bulb in my head went ding! I dove into the model in Inventor and modified the fan to have 5 blades instead of 4, and I added a ring with an airfoil profile to support the ends of the blades. This time I decided to test it outside, and when I spun it up to 30,000 rpm the fan flew off like a little missile in a line-drive straight trajectory. Not until the very end of its flight, some 200 feet away, did it start to arc and fall back to earth. 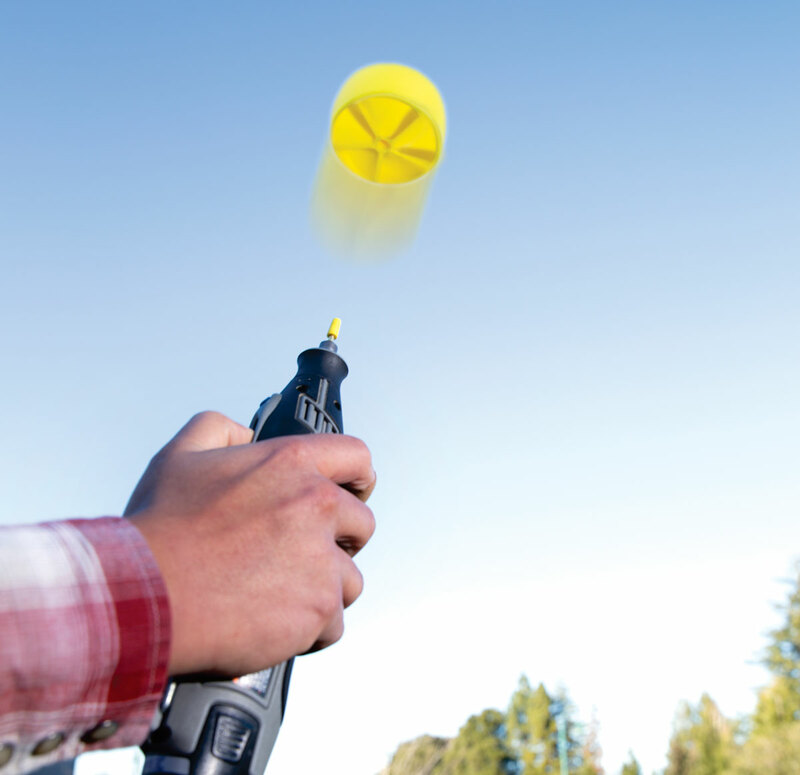 So here it is — the Dremel Devil, a 3D-printed fan that you launch from your high-speed rotary tool to soar up to 200 feet. Grab the file and get printing! The Dremel Devil was modeled in inches, so if your slicer program defaults to millimeters, you’ll need to scale up the part. The Flying Fan Dremel Adapter needs to be super glued or epoxied to a 1″ length of 1/8″ metal rod. The rod is then inserted into the Dremel tool’s chuck or collet. If you push the Dremel Devil too hard onto the adapter, it won’t release. It takes a bit of trial and error to figure out the right amount of pressure for reliable release. If your Dremel tool has a brake function when you switch it off, I’ve found that you can use the sudden deceleration to help the Dremel Devil release and fly farther. Never put fingers or other precious objects near the spinning flyer. Always aim the rotary tool and flyer away from people and property, and stand clear of the sides of the tool, since some 3D prints could fail when spun at high speeds, flinging debris to the sides. 3D printer with ABS filament ABS is tougher and more durable than other filaments. Dan Spangler is a freelance maker with a passion for fabricating speed, high voltage, and the things that go boom.